I’m lounging in my plush king-size bed, and the iPad sunken into the white sheets beside me tells me it’s 5.30 p.m. The floor-to-ceiling sliding glass doors give me uninterrupted views of the fiery sun descending swiftly over the horizon, casting streaks of glistening gold onto the waters below. Apt, considering I’m ensconced in a Sunset Overwater Villa that is perched on stilts above the Indian Ocean. I’m watching That ’70s Show on the wafer-thin Bang & Olufsen flat-screen TV, which is also, incidentally, controlled by the man Friday iPad. I call it man Friday because in addition to controlling the TV (including the direction it moves in), it also regulates the lights, AC and blinds. 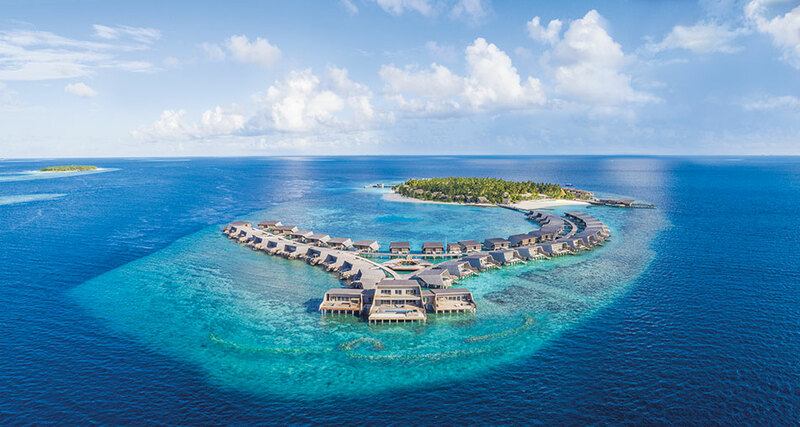 Earlier that day, I’d arrived at the island nation of Maldives, and my home for the next four days was The St. Regis Maldives Vommuli Resort, situated on the Dhaalu Atoll, one of the 26 atolls that make up the country. After a connecting SriLankan Airlines flight from Colombo, I, along with my fellow travellers, had arrived in Malé earlier that day to picturesque scenes of bright skies and crystal clear waters. Two friendly butlers from The St. Regis Maldives Vommuli Resort had ushered us into a swanky jet-black Bentley — our ride to the St. Regis lounge, where we were to await our seaplane transfer. Once on board, I caught glimpses of countless islands, each unique in shape and girdled by reefs that lent them the most gorgeous shades of sea green and turquoise to contrast the deep navy of the ocean. As our property appeared through puffs of cloud, I noticed that the Sunset Overwater Villas, along with the Sunrise Overwater Villas situated in a curved line opposite them, mimicked the pectoral fins of a manta ray. I realised then that the resort drew inspiration from marine life, evident in both its layout and decor.After gulping down refreshing chilled coconut water, our personal butlers drove us in buggies through the winding forested pathways of the island to our accommodations. Upon entering mine, I walked right out to the deck, dipped my toes in my private pool and then sat myself down on the overwater hammock from where I gazed out at the unbridled vistas of the Indian Ocean. After settling in, I walked down to the resort’s all-day restaurant Alba for my first meal, and was introduced to Fay-Linn Yeoh, senior director, brand management, St. Regis Hotels & Resorts Asia-Pacific. In keeping with their environmentally-conscious approach, the hanging lamps inside the main seating area were made from repurposed Indian pots while the bead ones lining the veranda were made from recycled shells. As we dined on a tasty lunch of crispy fried calamari, warm prawns with mango salad, crunchy beef strips and ‘khow phad’ fried rice, Yeoh filled us in on the finer details of the property before regaling us with tales of her scuba-diving adventures. After a delicious meal, I was pumped for what the evening had in store — a five-course degustation dinner at their underground restaurant Decanter that would be accompanied by eight of the finest wines from around the globe. We were joined by Yeoh and the property’s general manager Alexander Blair as well as executive chef Ayyoub Salameh, who had curated the menu for the night and wine sommelier Khazan Singh. At the start of each course, Salameh detailed the ingredients while Singh explained the purpose behind the wine chosen to go with it. The next day kicked off with a coral-garden snorkelling excursion. After getting our life jackets, snorkels and flippers fitted on at the dive centre, we were whisked far off into the ocean to our private strip of reef. When I ducked my head under water, what struck me was how I was precariously balanced between the turquoise waters of the reef and the dark azure of the deep dip in the ocean. While witnessing marine life within reach of my fingertips was absolutely surreal, two events in particular stood out — one was watching our instructor dive under water to play with a friendly sea turtle and the other was spotting a gorgeous reef shark. Famished after the swim, we made our way to the beachfront pizzeria Crust, where I downed a refreshing watermelon drink and somewhat calmed my raging appetite with a crisp bruschetta. For my main, I ordered a customised pizza, garnished with Sri Lankan marinated prawns and perhaps the most controversial pizza topping ever — pineapple. For all disbelievers — it was 100 per cent delicious! Post lunch, we were taken on a tour of the property that started at the largest — and not to mention, most expensive and exclusive — island property: the John Jacob Astor Estate, named after the founder of the St. Regis brand, who started it all back in 1904, in New York. Upon entering, I quickly understood why it wasn’t termed a ‘villa’, but instead an ‘estate’. The epitome of luxury, this two-floor property features a private balcony, gym, cinema room, terraced area with sunbeds and cabanas, three Jacuzzis, an infinity swimming pool and a view to combat all others, situated as it is at the culmination of the Sunrise and Sunset villas. 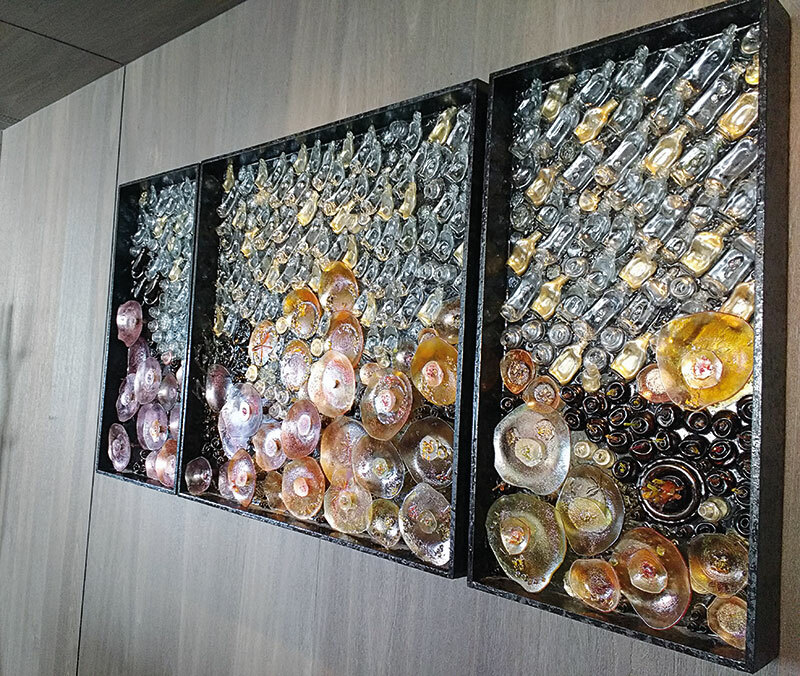 What caught my fancy was how the decor mirrored the property’s surroundings — think coral-inspired colour combinations for linens, sea urchin-shaped chandeliers and artworks made of recycled glass bottles found on the island. We were then driven to the Caroline Astor Estate, the second most luxurious property on the island, named after John Jacob Astor’s mother, the grand dame of New York. After touring the rest of the island properties, we landed up at The Whale Bar for a cocktail party hosted by Blair. 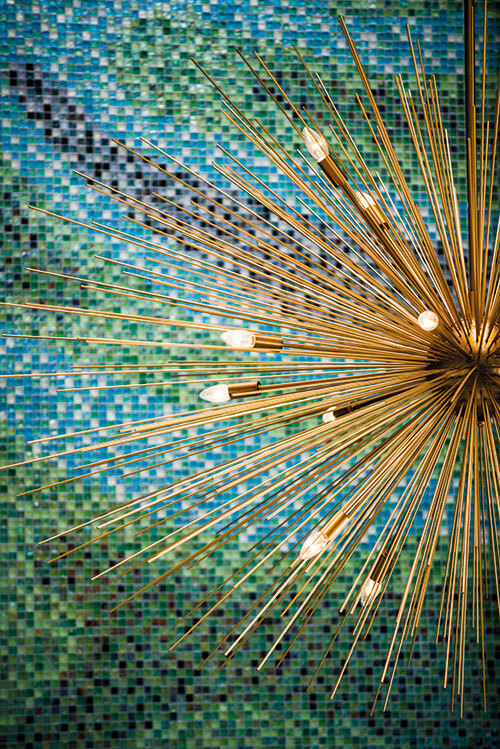 Shaped like a whale shark, the venue features a kitchen wall formed of 15,000 wooden scales upcycled from plywood remnants, but its most striking feature is the sea-life-inspired ceiling mural located directly above the bar — a traditional Maldivian pyrographic work by acclaimed artist Maya Burman. Here, I sipped on a refreshing cocktail of vodka, mint and green apple and watched the sun dip over the horizon, before a band of musicians strolled in and gave a thrilling, local song-and-dance performance. Closer to dinnertime, we were back at Alba’s beachfront dining area for a Mediterranean souk dinner; and, being the true-blood Parsi that I am, I wolfed down every meat available (grilled, barbecued and cold) before sprinting to Decanter to gorge on the decadent desserts. An anti-gravity yoga session at the Yoga and Meditation Studio was to kickstart the next day. Given the muscle pulls from the workout, I was looking forward to the afternoon’s session at the Iridium Spa, which is designed to mimic the shape of the lobsters and squids that occupy the lagoon below it. Following a soothing foot massage with Himalayan rock salts, I opted for a mild lemon-scented essential oil for my full-body Iridium Signature Touch massage. The highlight, however, was when the masseuse rubbed a warm sand bundle dipped in virgin coconut oil over pressure points in my body. The organic minerals penetrated my skin and did the trick in relieving the muscle tension. Right after, I immersed myself in the only overwater hydrotherapy pool in the Maldives, which was perched elegantly atop the Indian Ocean, for what was termed a Blue Hole experience (the ‘blue hole’ being inspired by the deep sinkholes found in certain reefs). After getting my back massaged by the powerful jets, and marvelling at the panoramic views of the limitless sea, I got ready for dinner at Orientale, their Asian cuisine restaurant. Curated by Salameh, the menu was a mix of Asian and Indian dishes that started off with a scrumptious starter course comprising, among other dishes, Alaskan crab and lobster spring rolls and an assorted sushi-nigiri platter. The main course was a smorgasbord of flavours, but the standout was the tender yakiniku wagyu beef rib-eye, which literally melted in the mouth. The following day was my last one at the spectacular property and a few of us made the most of it by going snorkelling one last time. After a heart-warming meal of char-grilled, fresh local lobster, it was finally time to say goodbye. As we boarded our seaplane for Malé, I couldn’t recollect a happier four days spent in company of wonderful individuals and thoughtful hospitality. Flying over the numerous other islands that embellished the sea, I ruminated on the popular phrase — ‘No man is an island’. If I were one, in purely literal terms, I thought, I’d sure love to be the Dhaalu Atoll.